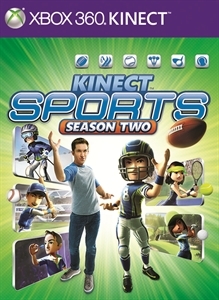 Kinect Sports, season 2, makes a rapid leap for the player, taking full advantage of the revolutionary technology of Kinect and the latest awesome features, including improved motion tracking. Let the whole family get together and play in the new Xbox LIVE Competition mode with friends around the world! Kinect Sports, season 2 allows you to take part in friendly competition and get vivid impressions to all players - from ordinary to real athletes and advanced sports fans. The game Kinect Sports: Season 2 presents six new sports disciplines and exciting new features that realize all the advantages of the revolutionary technology Kinect. Thanks to the latest family and friends from around the world can play together like never before in the new Challenge Play mode for Xbox LIVE and unleash their full potential in friendly competitions. Everything, from casual players to super-athletes, will be able to dive even deeper into the game. Six exciting new sports disciplines. Win a touchdown game, drive a birdie putt and reach new heights in American football, golf, baseball, tennis, darts and skiing. Your sporting world. Calendars of new events, leagues, summaries and common goals allow you and your friends to unite and compete with the world. Quick entry and exit from the game. Get into the game easily and exit to take turns playing, catch your breath and let others have fun. New Challenge Play mode. Introducing Challenge Play on Xbox LIVE and in every lounge around the world. Engage in a decisive one-on-one personal match with relatives or challenge your friends, which they can then take on Xbox LIVE. Voice control game. New features for voice control of the game create an even greater immersive effect.